Owen Sinclair (Acoustic Guitar/Electric Guitar/Vocals), Becca Skeoch (Harp), Joseph Peach (Accordion) and Cameron Ross (Fiddle). Converging from across the country, Tannara are all entangled within Scotland’s rich web of traditions. 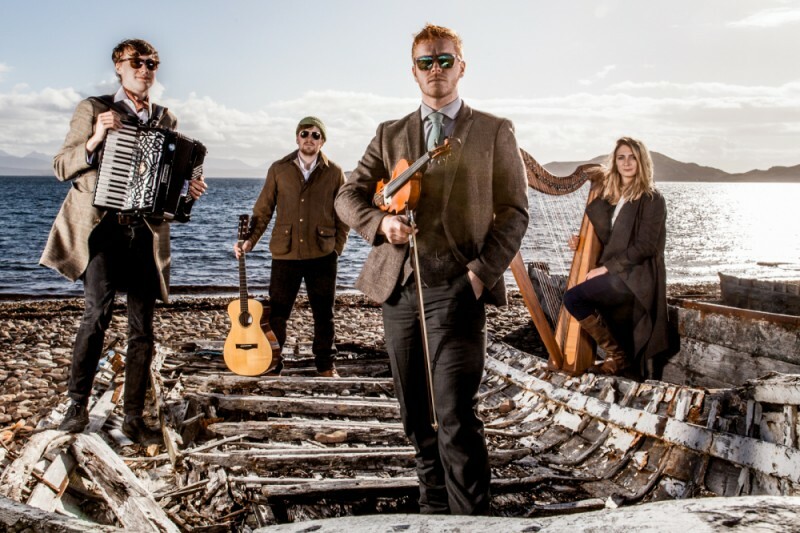 “What we play is best described as contemporary Scottish folk music: Considered, complex, arrangements that surround original tunes, modern tunes and traditional ballads. Collective experience makes gives our musical approach a unique flavour. Despite the material’s modernity, it’s hardwired in spirit to the tradition, of which our music is a continuation. At no point is the music pretty and delicate. When we play, there’s a raw energy that brings booming sets of tunes and songs together with moments of knot-in-stomach beauty. It’s four big personalities bouncing off each other to create big sounds. The result is an electrifying live act. Our debut album, “Trig”, produced by Rachel Newton, will be available to pre-order online and at live performances from the first of July. It’ll be released on the 27th of July at The Hug and Pint, Glasgow and following that, at the Venue at the Ceilidh Place on the 28th July. “One of Scotland’s brightest new up and coming bands”. “Tannara blend fiddle, guitar, harp and accordion with sensitivity, dynamic variation and tonal awareness”.